Reepham Town Council has agreed to support two housing development sites not identified as Preferred Options in Broadland District Council’s latest consultation. The two sites were presented to the Town Council at its meeting on 11 September. Originally submitted as an alternative to the Shortlisted Sites consultation held in autumn 2011, planning agent Hugh Ivins presented a revised proposal to the site on Whitwell Street known as X48-01. The outline scheme for 22 new homes now includes 0.5 hectares adjacent to the primary school to safeguard an area of land for future expansion of the school. Representing landowners R.S. Buxton & Partners, Ian Malton of CAM Architects presented a new proposal for the south of the Reepham 2 site. The 12.5 hectares lies on the settlement edge to the west of Whitwell Road and to the north and west of Broomhill Lane. The concept is to build new homes on just 4 hectares of the site, while on the remaining 8.5 hectares it is proposed to build a new sports hall for Reepham High School & College, along with improvements to the management of school traffic and the extension and enhancement of school grounds. The school already leases part of this land from the landowner. The sports facilities would also be made available to the community outside school hours. Further, development of this site would provide the opportunity to extend the existing cemetery on Whitwell Road if required. Reepham High School Principal Mark Farrar and Chair of Governors Tony Williams said the school had “tried to take on board as many views as possible”, but were conscious that the limited time prevented them from consulting as widely as they had wished. They did express concerns about the increased use of Broomhill Lane and traffic generally, but believed the potential new facilities and benefits to pupils and the wider community “outweigh the possible detriments”. At this stage, there is no figure for the number of houses proposed; Mr Malton said this would depend on whether this site was chosen as the only preferred site or in conjunction with other sites. At the meeting, Town Councillors id­en­tified the need for the nursery to be relocated as the existing facility on Stimpson’s Piece lacks some important facilities. Concern was also expressed by councillors about guarantees that the plans for the high school would still be included if this was chosen as a preferred site. However, Mr Williams said the school would be involved in the planning pro­cess from the start. As well as supporting the proposed development on Whitwell Street, the Town Council decided to back the new site off Broomhill Lane, albeit a late-runner, as they felt it offered many advantages for the high school and the community, and would be less intrusive than other sites. In its submission to Broadland’s Preferred Options consultation, which ended on 2 September, the Town Council objected to the sites on Dereham Road (90 houses) and Whitwell Road (50 houses) on the grounds that they would result in a detrimental impact on the town and are unsustainable for many reasons, such as overloaded infrastructure, extending development beyond the existing settlement limit, proposed housing density and access problems. In an earlier consultation, the Council also objected to the site on Whitwell Street over concerns about access to School Road/Whitwell Road. However, it did acknowledge the need for at least part of this land to be reserved for possible expansion of the primary school. 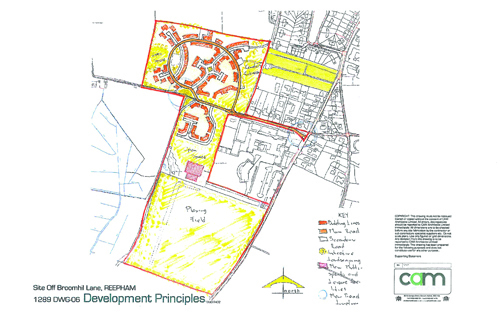 Reepham Town Council has been under pressure to select the “best” (or “least worst”) sites for future housing development, having been reminded that failure to do so would result in this choice being made by Broadland District Council, without reference to either the Town Council or the residents. However, until Broadland has finalised a local development framework, Reepham will continue to be open to various land owners/developers, and the Town Council will have to respond to any new proposal or planning application as they arise.